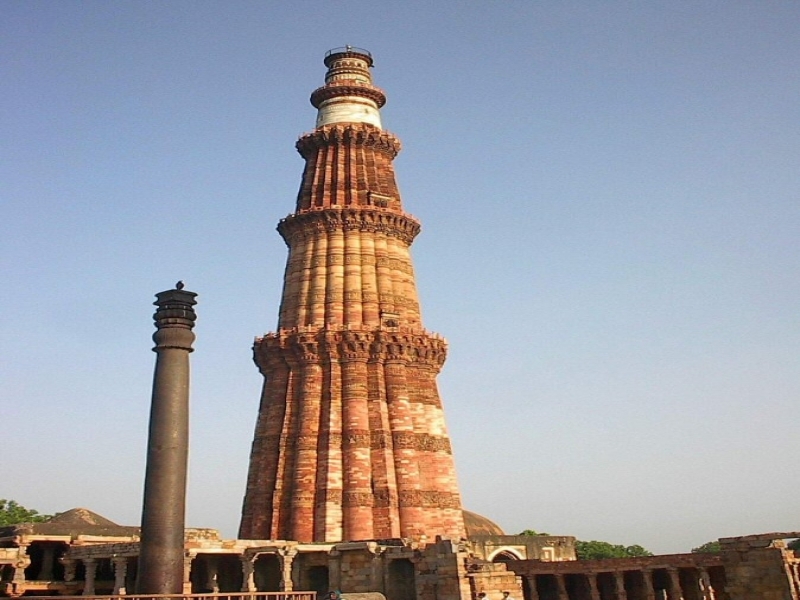 A world heritage site, the Qutub Minar is also considered to be the tallest minaret in the country. Made of marble and red sandstone, the Qutub Minar has a height of over 237.8 feet and has a base diameter of over 14.3 meters and contains over 379 stairs. This magnificent minaret was built first by Qutub-ud-din-Aibak in 1192 but however was completed by Iltutmish. The minaret has been surrounded by numerous other older ancient and medieval ruins and structures, therefore these are collectively known as the Qutub Complex. There are numerous other sources and traditions that states that the pillar was erected by Anang Pal, whose name is even inscribed on it, which dates to 1052. Made of fluted red sandstones, the minaret is magnificently decorated and carved with intricate writings and verses of the Quran. The inscriptions on the minaret are believed to be written in Nagari and Parso-Arabic characters. There is also an engraving on the Minaret that is believed to read Sri Vishwakarma Prasade Rachita or Conceived with the Grace of Vishwakarma. The minarets consist of numerous superposed cylindrical shafts and are separated by numerous balconies that are carried on Mugarnas corbels. It is said that the Minar by itself has been built on the ruins of the Lal Kot or the Red Citadel, which was once known as the city of Dhillika and was the capital of the great rulers of Chauhans and Tomars who are believed to be the last Hindu rulers of the city. Another one of the major tourist attractions of the Qutub complex is the nearby Iron Pillar, which is believed to be a great metallurgical wonder. It is believed that if any individual makes a wish and can encircle their back towards the pillar will have their wish granted. It is also said that the mixture of numerous different metals with iron produces gives the pillar such a high quality of smoothness. The famous Iron Pillar also is said to bear an inscription in Sanskrit in Brahmi Script of the 4th Century AD. The inscription states that Vishnudhvaja set up the pillar on the hill, which is known as Krishnapada in memory of a mighty king called as Chandra. There is a deep socket right on top of the pillar is an image of Garuda. It is said that the two top floors of the minar were damaged during the reign of Firoz Shah due to lighting, and once again it damaged due to an earthquake. The pavilion that was once built by Firoz Shah was replaced by Major Smith after another earthquake. However the pavilion was removed in 1848 and it now can be seen between the Minar and the Dak Bungalow. The general public was allowed to climb till the top of the Minar before 1981, after passing the narrow staircase. However after an accident when the electricity was gone, there was an unfortunate stampede and over 45 people were killed and most victims turned to be children. So now the staircase has been closed to general public. Been to Qutub Minar ? Share your experiences!